Telluride is tucked into a box canyon, surrounded on all three sides by 14,000-foot peaks. 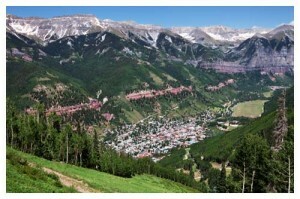 The town of Telluride is just eight blocks wide and twelve blocks long. Because of its significant role in the history of the American West, the core area of Telluride was designated a National Historic Landmark District in 1964. This listing is the highest level of historic status available from the United States Secretary of the Interior. These sites are so special that, in theory, they are eligible for consideration as national parks. With its colorful Victorian-era homes, clapboard storefronts, boutiques, art galleries, gourmet restaurants, historic buildings and more, Telluride is a delight to explore. Our citizens are committed to preserving Telluride’s historically significant architecture, open space, traditional design elements and, most of all, Telluride’s small-town mountain lifestyle. The towns of Telluride and Mountain Village are connected by a free, scenic gondola—the only transportation system of its kind in North America. The 13-minute ride is a daily event for residents and visitors alike. Exploring both Telluride and Mountain Village is easy with the convenience of the gondola. Used as a summer camp for centuries by Ute Indians and named by Spanish explorers in the 1700’s, the San Juan Mountains lured fortune seekers to Colorado with visions of silver and gold. By the mid-1870’s, the Sheridan Mine was the first in a string of local claims, and a tent camp was established in the valley below. Originally called Columbia, the rowdy mining camp became a town in 1878, and changed its name to Telluride. With the coming of the railroad in 1890, the remote boomtown flourished. A melting pot of immigrants seeking their fortunes turned Telluride into a thriving community of 5,000. Prosperity abounded and Telluride was full of thrilling possibilities. But when silver prices crashed in 1893, followed by the First World War, the mining boom collapsed. Miners moved on and the town’s population gradually dwindled from thousands to hundreds. In the 1970’s, Telluride reinvented itself. Legendary powder – a different sort of gold – was being mined. When the Telluride Ski Resort opened in 1973, the character of the community changed, and the town spun back into high gear. Born of the same spirit as skiing, cultural events, festivals, music, and performing arts were founded, and flowed through the seasons. It was again a time of thrilling possibilities. Telluride now has a reputation for world-class skiing and a stunning ambience. Due to its significant role in the history of the American West, the core area of Telluride was designated a National Historic Landmark District in 1964. This listing is the highest level of historic status available to sites designated by the United States Secretary of the Interior. Telluride is one of only four other Colorado communities with this honor. The sites are so special that, in theory, they are eligible for consideration as National Parks. Citizens are committed to preserving Telluride’s historically significant architecture, open space, and traditional design elements, and most of all, Telluride’s small town mountain lifestyle.